Back at the end of May, the WiFi Alliance announced a new WiFi Display certification program called Miracast. Making a standardization process for WiFi Display products to guarantee interoperability is a huge step forward to making adoption easy, and goes a long way to consolidating the growing number of WiFi Display-like standards. Though the specification hasn't been made public quite yet (public disclosure will come sometime in August), Nvidia appears to have already secured some level of platform certification for its Android board support package, though individual products will still need to go through WiFi Alliance certification to wear a Miracast badge. Today, Nvidia shot us a release and whitepaper with specifics about its Miracast compatibility. 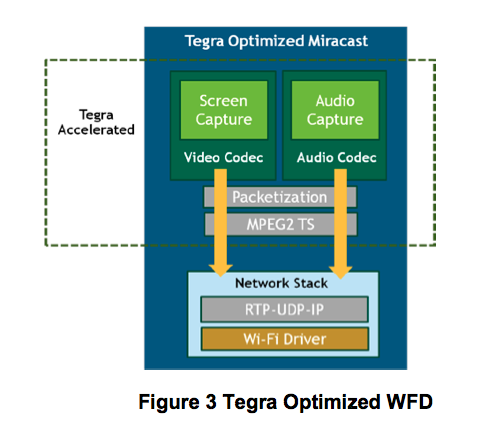 Probably the most relevant point is that Nvidia's Miracast architecture leverages the onboard audio and video encode blocks, and framebuffer snoop to minimize latency. WiFi Display mandates an H.264 baseline Level 3.1 stream at its core, which is easy enough to hit with encoders lately. Nvidia sent over a video showing off Miracast, and latency between the display and TV looks nice and low. I asked for specifics, but Nvidia isn't ready to share latency numbers until closer to production hardware. That said, other partners have given WiFi Display latency as low as just 16 ms (one frame at 60 FPS) for the whole chain. As an aside, Miracast is hugely important for the Android ecosystem as a whole to get to feature parity with Apple's AirPlay and AirPlay Mirroring functionality. The standard will be released sometime in August, with certification happening shortly after in September or October of this year. Well even with WiFi Display or Miracast, you'll need a display sink to get that video to HDMI for a TV or display, so essentially an open device which is analogous to an AppleTV for this functionality. Getting to that level is hugely important for the PC ecosystem, for Android, for all of the non-apple players who are looking for (and building to) that functionality but under different umbrellas which will be consolidated under Miracast hopefully. I'm having the same hope too.